I’m excited to share with you my explanation of these conditions, which I call "Neuro-Immune Conditioned Syndromes (NICS)." I have spent the last twenty years researching and refining this explanation. It is based on my medical paper which was published in a peer-reviewed medical journal in 2002. The paper was first published online in 2000. Normally this therapy was only available to a relatively small number of patients that I am able to see at my clinic, but now everyone in the world can experience its powerful effects. I suffered from chronic fatigue syndrome (ME/CFS) myself. Around 20 years ago, I developed it while studying at University. Since then, I have dedicated my life to finding an effective treatment for ME/CFS and associated conditions such as Fibromyalgia, Multiple Chemical Sensitivities, IBS, Burnout, etc. I have been completely well for many years, and I successfully treat patients globally. 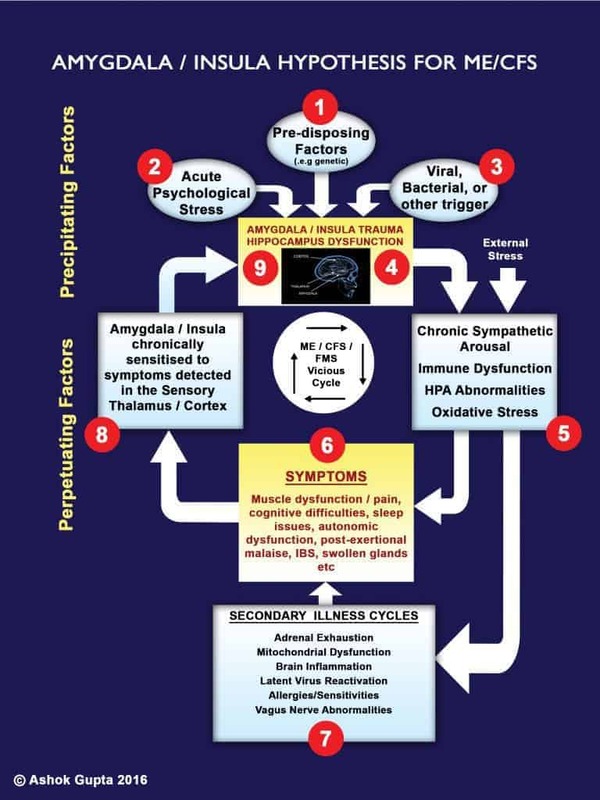 An overview of The Amygdala & Insula Hypothesis a ‘vicious cycle’ that, once triggered by severe stressors in people with certain risk factors can perpetuate neurological overstimulation, physiological dysfunction, and many physical symptoms. An explanation of major symptoms in the context of this hypothesis. A brief summary of Amygdala & Insula Retraining (AIR) concepts – how patients may break the vicious cycle by applying techniques that encourage the amygdala, insula, prefrontal cortex and associated brain structures to discontinue the hypothesized overstimulation. You can also sign up for the free trial and watch Session 3, which goes through the hypothesis in detail. My medical research seems to indicate that these conditions are neurological in nature, and may be caused by abnormalities in a brain structure called the ‘amygdala,’ and the ‘insula’. 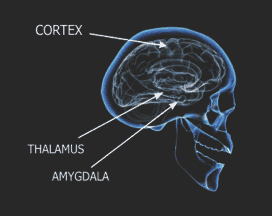 One of the amygdala’s roles is to protect the body from potential threats. This hypothesis serves as a potential unifying model for the various observations in patients. I published my hypothesis in the peer reviewed journal Medical Hypotheses in 2002. Right at the top, let’s start with the predisposing factors to developing these illnesses – i.e., the risk factors. These may include genetic factors and environmental factors yet to be fully determined. Then there are two other precipitating factors which contribute to these illnesses developing in someone. The start of the illness is often accompanied by psychological or physical stress, as well as some kind of acute physical illness. In the case of ME/CFS, that physical illness might be a particularly difficult virus or bacterial infection (e.g., Glandular Fever, gut enteroviruses, etc. ), or another kind of illness. In fibromyalgia, the physical trauma may be an accident, or ongoing chronic pain in a part of the body. In MCS, the trigger may be heavy exposure to a toxin. In IBS, it may be food poisoning or a similar traumatic event for the gut. For other conditions, they relate to the original triggering injury or infection. Gulf War Syndrome may represent a combination of all three illnesses to varying degrees, as at the time there was exposure to immunizations, toxins, and physiological stresses all at the same time. The combination of these precipitating factors changes the circuitry of the amygdala and the insula, making it continually over-stimulate the body (4). This conditioning happens unconsciously without a person actually realizing it is happening. The sympathetic nervous system is the emergency response of the body to threats. When it is triggered, the parasympathetic nervous system (bodily repair, detoxification, digestion, etc.) is switched off and energy is diverted to the emergency. It over-stimulates the hypothalamus and the whole HPA (Hypothalamic-Pituitary- Adrenal) Axis, which subsequently downgrades as a result, making it difficult for the body to respond to stress. The amygdala also over-stimulates the whole brain, keeping many brain circuits in a state of hyper-arousal. This adversely affects the levels of neurotransmitters in the brain, including serotonin and dopamine. There may also be conditioning in the immune system. This means that aspects of the immune system are inappropriately re-triggered in a unique pattern individual to each patient. Finally, this over-stimulation causes higher levels of oxidative stress in the body, and a compromised immune system. Furthermore, continual stimulation can cause secondary effects in the body, which then lead researchers to think that those physical observations are the cause of the condition, whereas they are simply symptoms of a deeper underlying brain abnormality. Over-stimulation can cause adaptation in receptors so that systems are down-regulated, or certain systems may simply exhaust due to over-stimulation, as is the case with the adrenal glands. Nitric oxide levels may rise (as per the observations of Professor Martin Pall), which can cause a whole host of secondary effects and symptoms in the body, including mitochondria dysfunction, perpetuating the entire vicious circle. Because the immune system is responding inappropriately, opportunistic viruses such as HHV-6 have the opportunity to flourish, increasing symptoms. Finally, at 7, secondary illnesses such as allergies and chemical sensitivities can occur due to the hypersensitivity of the entire system. Sympathetic over-activity means that sleep rhythms are affected, so the restorative “delta” sleep required for bodily repair is not effective. This has also been shown in Post Traumatic Stress Disorder, an illness where the amygdala has also been heavily implicated. This causes a patient to feel unrefreshed the next morning, causing severe exhaustion, and contributing to pain in fibromyalgia. These symptoms are detected by the sensory thalamus/cortex and the insula cortex – the parts of the brain that receive incoming information from the senses (8). * At 9, the amygdala is traumatized by any symptoms that it detects in the body, and instantly re-stimulates bodily systems at 4 again. Note that this central nervous system sensitivity (and resultant abnormal sensory processing causing heightened pain awareness) is gradually becoming a more accepted hypothetical model in fibromyalgia. This then perpetuates into the vicious circle as in the diagram. The severity of the conditioning effects in the amygdala, insula, and associated brain structures. The specificity of the conditioning; that is, what symptoms and what reactions were going on in the body at the time of the original trauma. The specific timing of the trauma ‘ although symptoms can change over time. Due to the secondary effects of the condition on the body, food intolerances can develop, as well as general sensitivities. This is because when the brain and body are on high alert, the amygdala (in association with other brain structures) is prone to learning new responses to stimuli it would not normally care about. When the sympathetic system is aroused, digestive and detoxification systems are turned down or switched off, which may explain why many patients complain of feeling “toxic” inside. A patient will also find that stress can exacerbate the symptoms – simply because it “speeds up” the vicious circle, and the body does not have sufficient resources to deal with that stress. The stress can be mental, emotional or physical. With some patients, the conditioning effects are not particularly severe, which is why some patients seem to regain their health through general changes in lifestyle. For others, the conditioning in the brain is severe and causes chronic long term illness. I wish to emphasize that I believe ME/CFS, fibromyalgia and MCS are real physical conditions, and are in no way psychological. The sensitivity conditioning mainly occurs unconsciously. As I indicated above, Gulf War Syndrome may represent a combination of all three illnesses to varying degrees, as at the time there was exposure to immunizations, toxins, and physiological stresses all at the same time. Currently, I do not believe that there are any pharmaceuticals which could target such a specific reaction in the brain. Most pharmaceuticals or supplements target the symptoms rather than the underlying cause. If the conditioning effects are mild, successful treatment of symptoms may bring full recovery, but in the majority of cases, this will probably not occur. Luckily the amygdala and insula constantly communicates with other parts of the brain, and that’s where retraining can take place. Other studies have shown that regular meditation can increase the volume of this part of the brain, showing that “brain” exercises can alter the structure of the brain. Amygdala & Insula Retraining is designed to strengthen the prefrontal cortex and restore inhibitory mechanisms in the insula, anterior cingulate and other associated structures. All the Amygdala & Insula Retraining techniques are now available as an interactive DVD recovery programme. 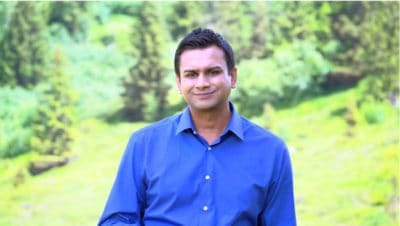 I found that most patients could not afford to come to the clinic for treatment, so I wanted to create something that was affordable and easy to use at home. It covers the range of physical symptoms as well as cognitive and emotional symptoms that those with ME/CFS, fibromyalgia, and associated illnesses may experience – explaining how they may be products of amygdala hyper-sensitization. The stress response is sometimes known as the “fight, flight or freeze” response. These responses, including excessive adrenaline, keep the muscles tense, and are only designed to be triggered for minutes at a time. I will not go into the neurobiology of this mechanism here (it is commented upon in the medical paper). Suffice to say that, given that the original trauma often occurs in the presence of a severe virus/bacterial infection, it is no mystery that the body will retrigger immune defenses as a way of making sure the body survives, even if no viral threat exists. This can often feel like having flu or a slight fever, as well as swollen glands and a sore throat, and may be the effects of chemicals called cytokines. This conditioning is likely to be stored in the insula, and retraining targets the insula in persuading it that no further threats are present. The amygdala and insula send direct signals to the autonomic nervous system, which co-ordinates many bodily responses including temperature and blood pressure. Therefore, abnormalities in autonomic function can be directly attributable to chronic stimulation by the amygdala. Anxiety is well known to cause sweating, and even temperature changes. The limbic system of the brain (which houses the amygdala and the hypothalamus) has been implicated in allergic responses and sensitivity responses. These systems become “over-cautious,” reacting to toxins and pathogens “just in case” they represent dangers. When the amygdala and insula are on high alert, it is prone to learning new sensitivities and threats which ordinarily would not have been reacted to. The autonomic nervous system affects all the organs and systems in the body, and that is why so many wide-ranging symptoms are experienced. And because the amygdala and insula are at a heightened state of awareness of all the messages coming from the body, new fears can be “learned.” This means that even when innocuous signals come into the sensory neurons, these signals can be misinterpreted as dangerous by the amygdala and insula. This happens because some patients can tend to monitor signals from their bodies, and signals can be perpetuated. This explains why patients can develop added symptoms, which can mysteriously come and go. I do believe that these symptoms are temporary – that they are due to systemic functional changes in the body, rather than permanent organic damage. Stopping the amygdala and insula’s hyper-reactions allows the body to trigger the parasympathetic system, meaning the body’s own healing mechanisms can bring it back to balance and homeostasis.